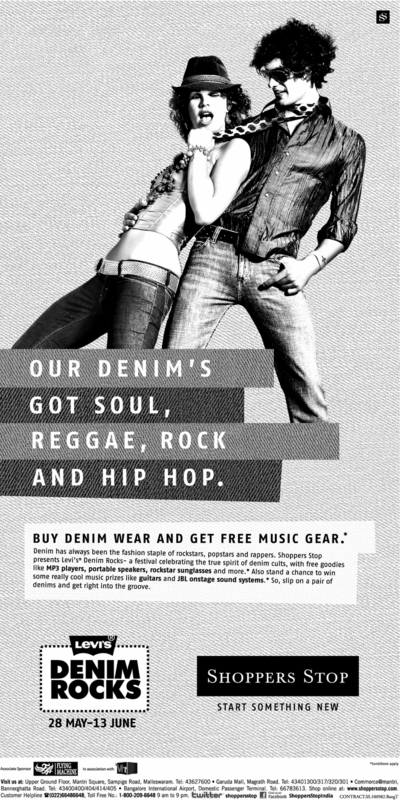 Learning from Levis; Collaborate, Cooperate and Succeed. It’s quite rare to see (in the Indian context) Brands working very closely with Retailers or Malls. Most often, each Brand would like to leverage its presence within the large format, be it a Department Store or a Hyper or even a Mall by taking up pole position (read – prime locations at the entrance). 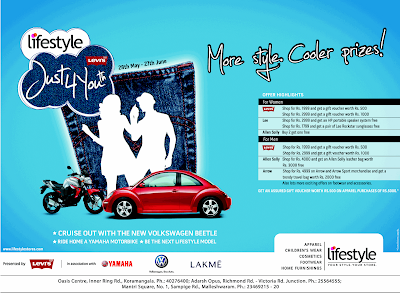 Retailers cash in on this trend by charging a premium for such locations which Brands pay, albeit not happily. Many Brands, international, domestic and regional believe that a prime location within the store would attract footfalls and the Brand magic would result into higher conversions. In most cases, it is not so. Corner locations alone do not guarantee higher business potential. What’s important is for the Brand to work closely with the Retailer in mutual interest and both must make best use of each other. A recent example is that of Levis. I have read somewhere that on an average an American owns 1.65 pairs of Levis. That’s very similar to the count on Wal-Mart, that over the past 40 years, over 90% of all Americans have visited the world’s largest Retailer atleast once in their lifetime. In India, of course we cannot share such figures with authenticity though. Back to Levis. The Brand was among the earliest entrants in the casual-wear denim wear segment in India during the early 90s and continues to remain among the most aspired affordable fashion brands in India. 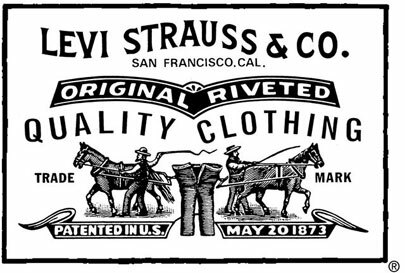 After a small lull during mid-2000 decade, Levis has bounced back in strength. A very strong merchandising and marketing team is at work and the results are on the face. After many successful campaigns over the past months, the most recent one is an encouraging trend set by the brand again. This time, its outright collaboration. Levis and Lifestyle, the Department Store chain owned and managed by The Landmark Group of Dubai, have come together in what seems to be among the most talked about promo in town. The tagline, aptly named “Just4YOUth” targets the young by age and young at heart to enjoy the mood and spirit of youth. This at a time, when most first-timers enter their college days, an important part of growing-up. To have a bit of variety and participation from other brands, LEE and ARROW have also been roped in. The promo seems simple; an assured gift with a minimum billing and a chance to win a Mega Prize, VW Beetle, the newest and coolest Youth icon in the making in India. And there are other prizes to be won too, including a YAMAHA motorbike and voila, a chance to be the next model for the Department Store chain! This is seemingly similar to the promotion that was held a year ago at Bengaluru International Airport to celebrate its first anniversary. Although many sceptics believe that such promos do not offer tangible benefits, I refuse to believe so. 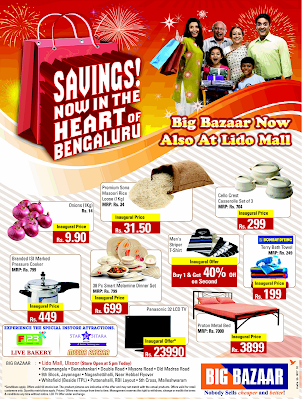 Indian shoppers are value-seekers and if they see anything additional to their purchases, they would just grab it. It’s been so for many years now and will remain so for times to come. The simple promo is a great crowd puller into the Lifestyle Stores, especially for Levis fans to check out the latest collections. 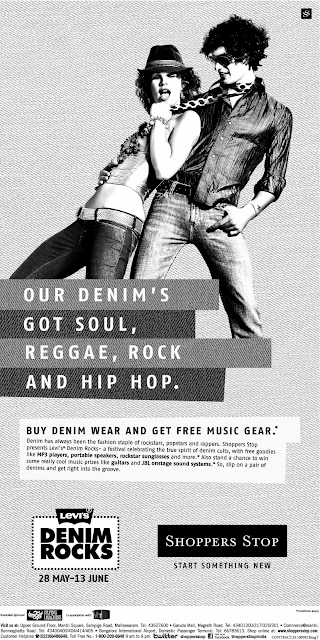 On similar lines, Levis has also partnered with Shoppers Stop, India’s largest Department Store chain with another exciting promo – “Denim Rocks”, attracting music lovers by offering a Promotion revolving around the most favoured fabric of rock stars, pop stars and rappers. Here, the associate partner is another fashion brand FLYING MACHINE. Today, Brands should seek more prominence among shoppers by not just having a premium location but by experimenting such promotions from time to time. The mantra is clear – Collaboration between the various parties, i.e., Brands and Retailers. Cooperation among Brands within the store. And the result – Mutual success for all. 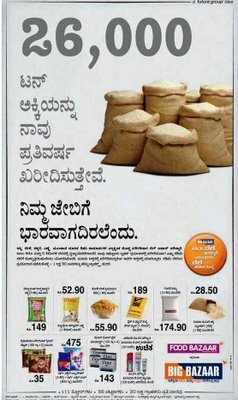 Wish more brands understand this simple logic, rather advertising silos on supplement first-pages! I was quite intrigued when I first heard of this, but then came to terms. 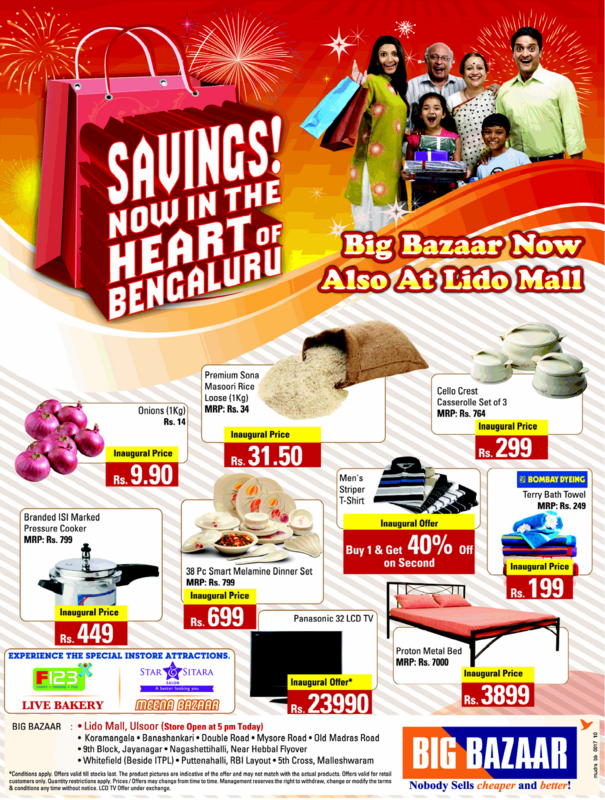 It was about a month back when I first heard that the erstwhile Lido Mall would be reconverted into a Big Bazaar. 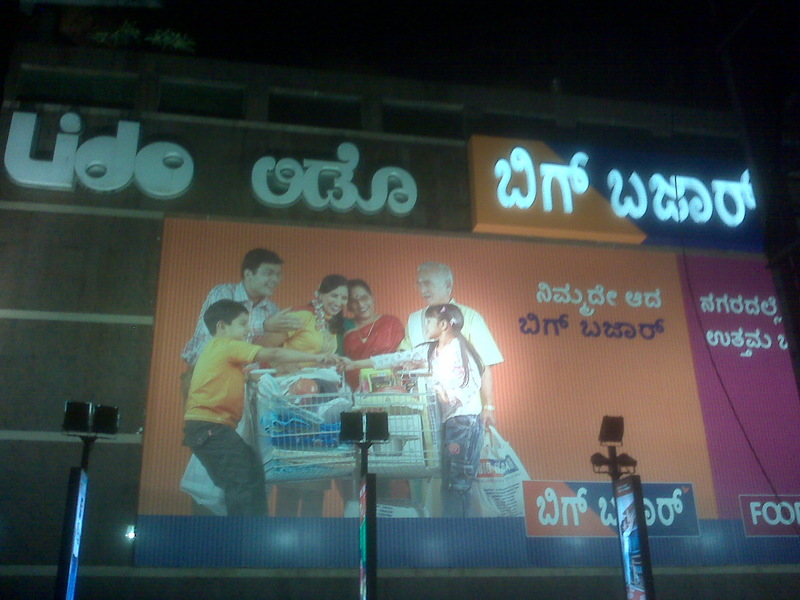 While Lido Cinema, one of the oldest landmarks in Bangalore was brought down to give way for two new unique landmarks, Ista hotel and Lido Mall four years ago, it was quite a shock that the Mall was getting dismantled. But that’s better than running a Mall without footfalls. 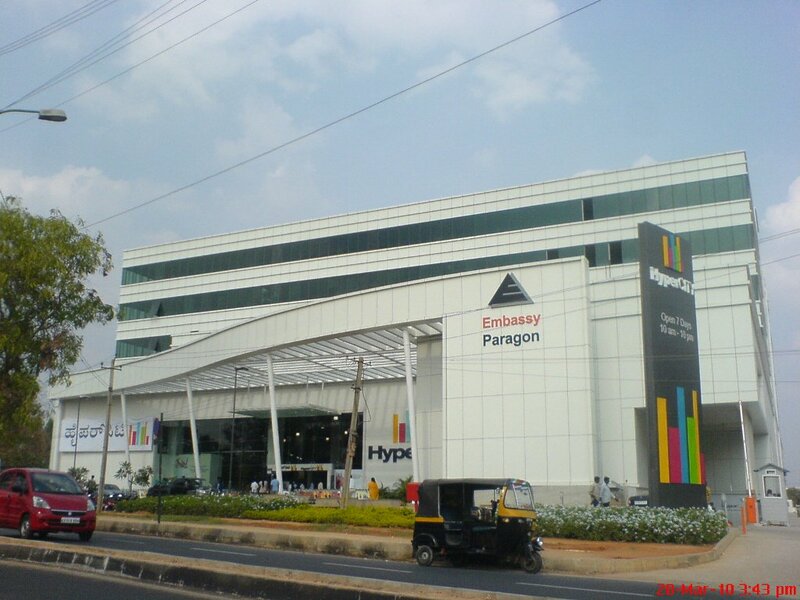 The Mall, among the many that are being managed by an arm of The Future Group housed International Fashion Labels such as Next, Guess and Etam apart from a spacious Pantaloons Fashion store, Body Shop, Lee Cooper, Marks and Spencer, etc. Cafe Coffee Day, which occupies the ground floor corner was a saving grace to the mall which has only seen footfalls dropping over the years, thanks to the ongoing construction work of Bangalore Metro Rail project. The block on the opposite side has a McDonalds on the Ground Floor along with the Box Office of Fame Cinemas, which partnered with Lido to manage the multiplex spread over the top floors. 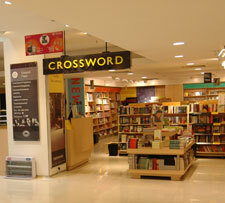 The Mall was actually very convenient, the only one so to say in the “MG Road” vicinity. In fact the Cinema runs to full capacity during the first weekend of new movies and apparently, night shows have higher occupancy than day shows, thanks to its prime location which is accessible quite easily within 8-10 km radius as well as for office-goers in the CBD area. I did see the signage of Big Bazaar coming up a few days ago outside the Mall and the Newspaper Advert recently pulled me into the store, for my love of Retailing. I never imagined that an operational Mall could be put to good use; better use rather by converting it into a Hyperstore (or whatever one may want to call BB as). While Cafe Coffee Day still retains its location and I would believe would perform better with a stronger anchor in BB, all other tenants have been dismantled. The main structure remains as is; the escalators and elevators that were used earlier by the countable walk-ins now transport busy shoppers and their families up and down, albeit both transporting-equipments are not best suited for the shopping trolley – wielding consumers at a Hyper. 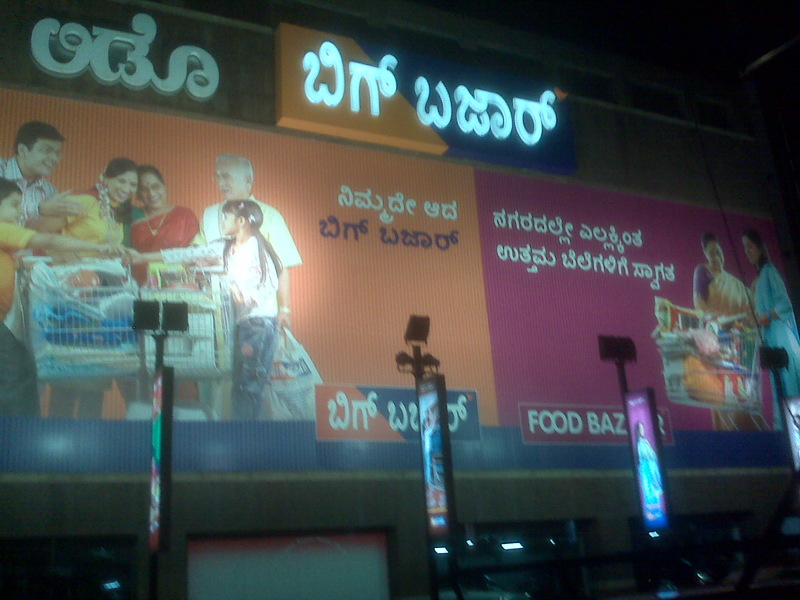 The main signage outside has indeed changed, or rather elongated as “Lido Big Bazaar” - Honestly, looks nice. The tiles that were used earlier for International fashion concepts are now being used to sell private label grocery and electronics, Chinese-imported furniture and clothes! Well. The Ground floor, which was reserved for parking remains so, while the First floor houses Food Bazaar, Furniture Bazaar and Electronics Bazaar. So, it’s a no-shocker to see Plasma and LCD Tvs next to household items and Deodorants. The planners have indeed done their best although a bit more adjacency planning would have helped. The second floor houses Fashion Bazaar – a street fashion concept that is being popularised using youth icons – Cricketer MS Dhoni and Actor Asin. Apparently, they are among the two icons who relate the most to the trendy youth today, almost a boy/girl next door positioning created deftly by agencies and their brands. F123, a gaming zone that is gaining popularity quietly across the various formats in the group sits in a corner while Musicworld with two gondolas serves the latest as well as evergreen hits. No eating joints as such, which would have certainly done very well, just a counter that sells street snacks. Call it coincidence; the guy behind the counter was conversing comfortably with two different couples in Bengali. Strange, yet true. Just when I realised that the music that was being played in the background was in Hindi, not in Kannada (the vernacular in the city). Does it matter so much? Well, yes to some extent. Retail is all about regionalising – as I always love to say, Think Global, Act Local, and Retail Regional. While Big Bazaar has been communicating and advertising within and outside the store in the vernacular languages across the country, it is indeed important to maintain the connect while the shopper steps into the store. Not just the music or communication, but some local QSR would have complemented the shopping experience too. There are enough and many who are awaiting a chance to serve within the store and that’s probably the opportunity for all the three, the Hyper, the local caterer and the customer. After all, the shopper has just walked off from her favourite neighbourhood grocer to the swanky a/c shop! Overall, it was great to see the giant in the middle of the city. The promise, of Savings in the Heart of the City seems to be a big one though. Time will tell and I will live that day to see it firsthand and write about it again. Long Live the Indian Consumer. Long Live Indian Retailing. While driving back home after my MBA Classes on Sunday evening, I realized I needed to buy a freshener for my Car. 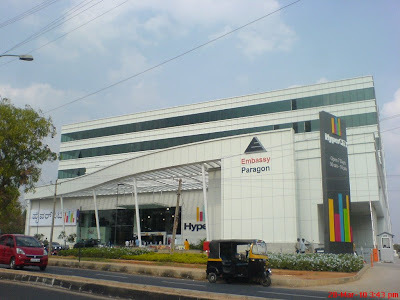 The nearest outlet where I could buy was the 150,000 sft Hypercity at Marathahalli, (there couldnt be a better location at Bangalore, given that most of the IT/ITES employees dwell in this area largely with annual household incomes ranging from Rs. 20-30 lakhs) that opened its first outlet in the city in March 2010, after four successful models in Mumbai and one each at Jaipur, Amritsar and Hyderabad. But would someone visit a hyper for buying a single product? Not really. But my visit was also meant to be academic. After all, I haven’t seen the newest entrant in my business in Bangalore. So I headed straight towards the store with loads of expectations. After negotiating the busy signals, I saw the store to my right side although a number of cars were parked on the other side. Wasn’t sure if they were visiting the Hyper though. Drove further ahead, took a U-Turn after half a km and drove back to the store. Mine was the tenth car waiting to enter the basement parking. The security was polite and there were signages that suggested the car parking rates (of Rs. 15/- for three hours) and that it could be redeemed on a minimum purchase of Rs. 100/- within the store. The store had two basement parking levels, enough to park over 150 cars. Bike-Parking, I noticed earlier was in front of the Mall, not more than 50 or so. Understandable, as most who visit Hypers carry more than 2-3 bags and wouldn’t be able to carry them in a bike anyway. Basement parking, while well-lit was vast and the new security staff were yet to understand the speed at which vehicles were moving. There weren’t any speed-breakers to control our Ferrarians and Force Indians (sic), a must in most of our parking lots. After waiting for the elevator for some time, decided to walk up the stairs and ended up on the northern side of the building! When I entered the store, the first words in my mind were WoW. This was so much needed for Bangalore. With an existing dozen Hypers of such a size, this one seems to be another important location in town. To my surprise, the F&V section was at the entrance. Why surprise – because the fruits and vegetables could get damaged after the shopping trolley is full. Some logic must have prevailed the experts, I guessed. Further ahead, I found two outlets, one that sells Juices and then a Cafe Coffee Day. While the juice bar was almost empty, there wasn’t space to sit in the cafe (with over 8 tables and 24 chairs occupied). A cafe at the beginning of the journey? Well, some logic, I said. Next was Fish & Meat seclusion, well organized as there was almost no pungent odour coming out. But what happened when the trolley containing meat was brought out to shop other things? Just shut-up and put-up, I said to myself again. Next was a wide area with a signage that read – Wine and Beer. But there were only juices and dry fruits – possibly they are yet to get the mandatory license to sell alcohol. Then I found crockery brushing walls with homeware and plastics and electrical. Finally, I was at my destination – Car fresheners, although I was advised by the polite staff that they don’t keep my favourite brand Ambi Pur. Cheap and Expensive Chinese imports only, strictly. But its upto you, she said. Adjacent to it was a Salon and a couple of eating joints – one that sells Ice-Cream, and two other small ones that sold almost everything that was edible. One of them was aptly titled “Nashta-Chai” – liked the name and was intrigued to see their offering. “Delicacies from the streets of India”, screamed the tagline. After asking for six out of the 30 item menu, ordered a portion of Bhel Puri, a typical delicacy from the streets of Mumbai and Kolkata. Except for the paper plate and plastic spoon, there wasn’t anything local to go by. Spinach corn sandwich @ Rs. 74, Margherita Pizza @ Rs 84/-, Cappuccino @ Rs. 39/-. And possibly the only local delicacy Bisi bhela Bath @ Rs 74/- and the ubiquitous South Indian Filter Coffee @ Rs. 29/-. What’s so local, I guessed. Probably the boys who prepared them with love and perfection were. No Bill was given, just a small piece of paper scribbled with words! Impatiently, stood up to continue my tour, errr, shopping. The travelator took me to the first floor, which greets visitors with gym equipments, tread-mills and bicycles. My wish to buy a bicycle was still not achieved as there was no BSA or Hero cycles. Some phoren brand that I couldn’t relate to or agree with for cycling within the locality to buy vegetables and enjoy fresh air! The next area was Electronics and mobile phones. As always, this is the most crowded areas. I have stopped visiting these sections anymore – have vowed to myself that I would pester the staff only when I close to deciding what to buy – I haven’t even made my mind on the brand or type, LCD, LED, Plasma, whatever. Next in line was Home furniture, a miniature furniture bazaar with half-a-dozen model rooms. This section leads to men’s, children’s and womenswear. In between was Crossword Book store. What is the book store doing in silo? I guessed. Sssshhhh. Came the answer almost on the spot. There were a few seats where some were trying hard to browse through the books – No, the books weren’t sealed, but there wasn’t any light where they were seated. The cashier empathised with me and said he also had the same feedback. We both hoped that somebody would do something about this. Good luck. After picking my weekly pick of print media - Time, Newsweek and Business India, I proceeded further ahead through the kids clothing, casually picking a small toy and a dress for my daughter. I was almost done and was impatient to bill and leave. While coming down on the travelator, I noticed that the homeware and crockery shelves were looking full. In this business, an indication of which category is doing well through the day is the disruption on the shelves. By looking at the number of “facings”, one could say how popular a category was. If those hundreds weren’t shopping anything across various areas that I passed by (except the avid book readers and enthusiastic browsers), then what are they doing? Bingo – here was my answer. Most were filling their pantry since it is the third week of the month and they would need to top-up the shelves at home. Surprise Surprise – 6 out of 30 cash tills weren’t working (Sunday, 8pm). No more than 2 trolleys and their families of 4-5 could stand in each Q. I went past twice to find the lowest crowded Q and succeeded in one. Surprise Surprise again – on the impulse bin were six units of Ami Pur – the very SKU that I came to this outlet. With a glad smile, picked the same and billed along with other items. The Bill amount was Rs. 450/- (and magazines were Rs. 195/-). So, a total spend of Rs. 645/- for someone who came to buy a single SKU that cost only Rs. 99/-. That’s the power of Hyper-Retail. It is so compulsive, that needs would be remembered as one walks by. When I pulled the car off my parking lot, I realized that the spacing was adequate even is some car drivers hadn’t parked well within their yellow lines. But to my horror, the ramp-up was just 7 feet or so! The adept-driver-in-the-making in me was lucky to have pulled off unscathed, but it was more a miracle than skill. So, do Hypers do well just by having a larger box – making it larger than existing ones in the market? Not really. What separates the BEST from the others is not multiple facings of the same SKU, 3 dozen cash tills and larger complexes, but really the way it is retailed. Hyper, as the name suggests means BIG and Wide. The variety needs to be really deep and wide. Across categories. My wish to our friends in the business – Make it Large, but not just the size of the building. To ensure, we spend money and time not just during the first visit, but every time thereafter. Wishes. As I always say and believe, Security (and insecurity) is a state of mind. The recent security alert issued by the US about an impending threat at New Delhi proved to be wrong timing; within hours of such a statement, Times Square at New York was in the News for all the wrong news. An unidentified car was found at the corner, security was alerted, a bomb was found and diffused, which was later pronounced by the officials as an amateurish attempt. All said and done, it did spread some scare all across. And the US once again bore the brunt of its lax security, while always preaching nobility to others. WSJ interviewed some tourists at Times Square if they would continue their trip and the answer was obvious – Yes! Life has been very different for all of us around the world since 9/11 and 26/11 (in India at the Taj) was the scariest that we have come close to. Yet, life moves on. 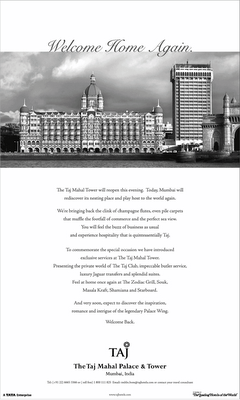 The Ball Room of The Taj and some parts of The Oberoi at Mumbai that were closed in Nov. 2008 were reopened a few days back although the memories of those “48 hours” still haunt us a lot. Airport security has been apparently beefed up ever since, but honestly I don’t see much difference, atleast in India. At several Indian Airports, many of the security counters are not deployed even during peak hours and the guards who are overloaded as their colleagues who are busy chewing peanuts and engaged in busier conversations, one could imagine the vigilant security of the officers in charge. Those who frisk passengers do not bend until the feet of passengers – either they have back pain or think it is below their dignity. Whichever way, laxity at its best! So, would such security alerts deter shoppers? What should the Shopping Centres, Malls and Retailers do to counter such situations? The least one can do is to maintain vigil. What’s required today is to be aware of what’s happening around. This could have averted an incident such as the one that happened at The German Bakery in Pune. Malls and Retailers today have deployed security staff at their entrance – to frisk and check visitors, but this is again a joke. No one really knows what these detectors can find. However, this is atleast a beginning. With summer holidays already in place and shopping & recreation coupled with vacations being planned, I sincerely doubt if these “alerts” would really hold us back. After all, Insecurity is a state of mind and one has to conquer it from within.